The CoMOLA optimization tool was applied to the Kromme Rijn area. 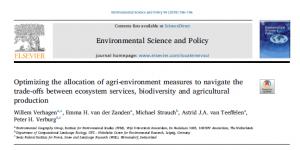 Results showed that all agri-environment experiments increased the environmental objectives at the cost of pasture production. Agri-environment measures including all Land Use and Land Management allocations, all options, were capable of simultaneously enhancing newt habitat and fruit yield. Priorities areas for LULM allocations were mainly located in and around orchards in the centre of the Kromme Rijn, i.e. mismatching the areas designated in the nature conservation plan. Optimization results indicate that if additional objectives and agri-environment measures would be included in the conservation plan, the preferred locations for these measures would be located differently. Mainly, preferred locations would move to the centre of the Kromme Rijn area in and around orchards. In term of land use and land management, we showed that with a more optimal allocation of measures, it was possible to meet species conservation objectives while simultaneously improving on a number of other environmental objectives.